EnergyShieldFX Reflective Multi-Layer Insulation (RMLI) utilizes the newest reflective level of technology with several layers, beginning with 99.9% Pure Polished Aluminum on both sides, and a fire resistant mineral fiber core that can withstand up to 550 degrees Fahrenheit. EnergyShieldFX has one of the”best” fire ratings in the industry due to it’s fire resistant core materials. In addition, a “Thermal Break” between the two layers of pure aluminum creates a “Thermal Dynamic” air space which causes the material to resist heat similar to the layering of clothing when going out in cold weather. Our product uses a thicker layer of aluminum that reflects more than 97% of the critical heat that either enters your home in the warmer months and escapes your home in the colder months giving it the highest “E” (Emissivity) value, which means the ability to reflect radiant heat - the most prevalent heat (most heat gain and most heat loss in your home is from RADIATION HEAT transfer). Every square inch of the material is perforated so it can breathe easier and allows moisture to pass through with the best “perm” rating on the market. Perm refers to “permeability”, which is the ability for moisture to pass through the material. Traditional insulation ( blown in or batting type insulation) affects only two of the methods of heat transfer, which is conduction and convection, with virtually no affect on radiant heat transfer. Traditional insulation holds heat like a sponge holds water. Just as a sponge allows moisture to evaporate, so does heat evaporate from your insulation-JUST LIKE moisture evaporating from a sponge. Heat then ALWAYS transfers to the coolest air space which means your heat ALWATS transfers to the INSIDE of your home in the summer and to the OUTSIDE into the in the winter. Traditional insulation is OLD technology and only slows down the heat transfer process. Eventually, depending the amount of insulation you have, the heat WILL pass through it, either going into your home during the summer or going out of your home during the winter. EnergyShieldFX STOPS more than 97% of the most prevalent heat coming in or going out of your home, as well as the conduction heat and convection heat. This means that EnergyShield FX can do everything your traditional insulation does and much, much more! This means saving MONEY and saving wear and tear on your heating and cooling equipment. EnergyShieldFX uses a patented technology and “HEAT SEALED” binding which reflects more than 97% of the most invasive heat-RADIATION. In addition, it also affects the CONVECTION and CONDUCTION heat transfer as well. EnergyShieldFX combats ALL three methods of heat transfer and has been tested at a leading independent lab proving a 12.7 “R” Value (Heat Flow Down Test) in just a layer ¼ to 3/8Th inch thick material. EnergyShieldFX technology was originated from the NASA Space Program and has been used since the Gemini and Apollo programs up to the most recent space programs. Today, this technology is also used in the aircraft industry, the automotive industry, the HVAC industry, and many other industries that require better reflection of radiant heat transfer back to it’s source. Forest Fire fighters use reflective aluminized blankets to protect themselves in fighting forest fires. 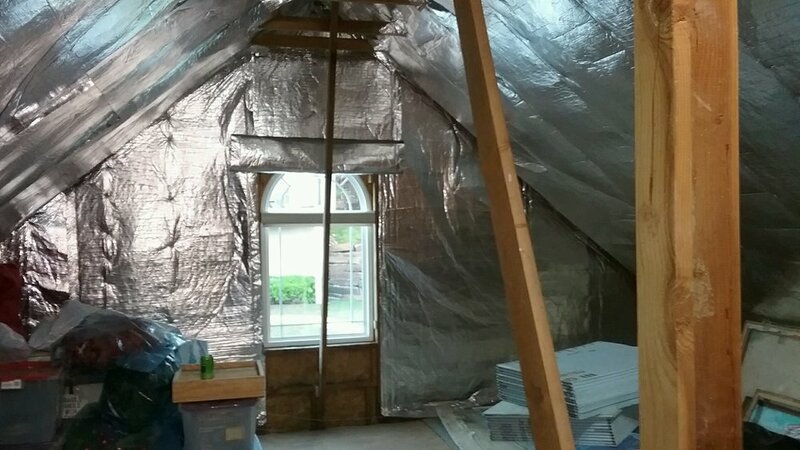 Insulation, Heat Reflection, and Ventilation are critical aspects to the ATTIC ENERGY SYSTEM. Include one the EnergyShieldFX Solar Powered Attic Vents in your home to help complete your “attic energy system”! Both roof mount and gable installed solar powered attic vents are available. These units can move up to 1200 cubic feet of air per minute. We offer three different motors sizes (24 watt, 36 watt, and 60 watt) and, depending on the size of your home, the foot print of your attic, the cubic footage of your attic, the configuration of your home, will determine how many units and type would be recommended. A certified energy consultant can determine the proper size motor required to maintain an efficient attic ventilation system. Our housing and flashing is high grade aircraft quality aluminum and are seamless to prevent any leakage, They are powder coated and available in three colors, black, bronze (brown), or grey. The motors are “direct current” which allows it to have no moving parts and NOT wear out, smooth whisper quiet operation, and are secured to isolations brackets. The fan blades are 5 blade non-corrosive aluminum, precision balanced, with high CFM output. We also use a protective “animal screen” , which is a stainless steel wire mesh and keeps out debris, bugs, birds, and small critters! Our solar panels use a Photovoltaic technology and are rated to withstand up to 3 ½ inch diameter hail as they use the strongest polycarbonate shield available in the industry. The panels are adjustable that does not interfere with the air flow exhaust system. An imbedded solar panel option is also available, which utilizes a “lower profile” design. Our Solar Powered Attic Fans cost ZERO to operate, offers a 25 year factory warranty, and are proudly made in the USA. Ask about the 30% Federal Solar Tax Credits! We have extensive knowledge in LED energy efficient lighting which can offer up to 75% reduction in lighting costs for both your home or your business. We also offer design applications that can involve , color of the lighting for the right application, luman output, and the right bulbs or fixtures for the project. We take the confusion out of lighting! We offer a special paint with additives that offer similar heat reflective technology as retrofitting insulation. Some homes do not have an attic or have areas where installation is prohibitive. Why not paint on a reflective paint from the inside which can be tinted or made to any color you choose. This really does work and our customers testify to the heat resisting benefits and comfort it provides. Wrap your water heater with the same technology we use in your attic maintaining heat longer in your tank reducing the amount of energy necessary to heat and lengthen the time the water in the tank stays heated. The solar power pod is a revolutionary approach to providing solar power virtually anywhere. As a fully self contained system, it is ground based and can be placed anywhere that can provide the best exposure to the sun. The azimuth can be optimized for the latitude as it is adjustable and even has the ability to adjust based on seasonal settings. It is constructed with the best components available.